04:15:00 Makes 12 servings, 1/12 recipe (68 g) each. Makes 12 servings, 1/12 recipe (68 g) each. Sprinkle crumbs onto bottom of 9-inch springform pan sprayed with cooking spray. Add boiling water to jelly mix; stir 2 min. until completely dissolved. Cool 5 min. ; pour into blender. Add cottage cheese and cream cheese product; blend well. Pour into large bowl. Gently stir in Cool Whip. Pour into prepared pan; smooth top. Refrigerate 4 hours or until set. Remove rim of pan before serving. Prepare using 8-inch springform pan or 9-inch pie plate. Garnish with fresh mint sprigs and thin orange slices before serving. Add 2 tsp. orange zest to blender with cottage cheese and cream cheese product. 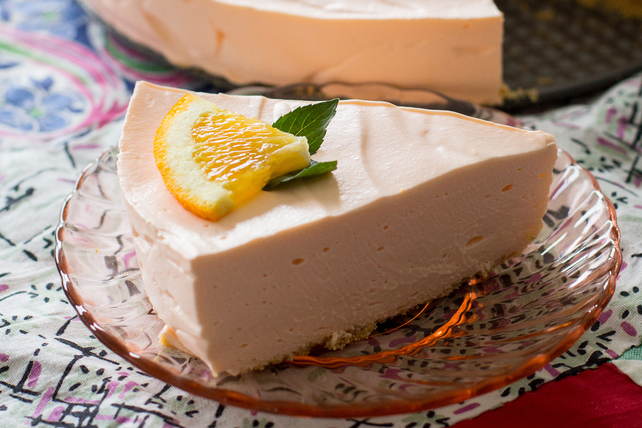 You're sure to love the citrus flavour of this creamy cheesecake. And as a bonus, it can be part of a healthful eating plan. Serving Size Makes 12 servings, 1/12 recipe (68 g) each.